Beatriz Espinoza, 34 years old, and her six children live in a humble house made out of tin and with dirt floors in the Villa Reconcialicion neighborhood in Managua, Nicaragua. The area where she lives is poor. She earns a living by selling vegetables, sodas and snacks from “El Mercadito,” as people refer to her store. 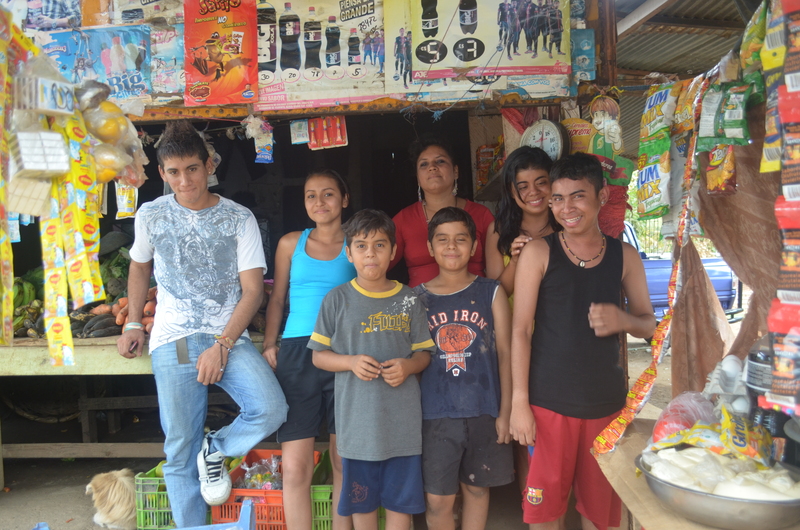 A few years ago, Beatriz did not have a job, let alone the means to start her own business. Everything changed once she became a Pro Mujer client in Nicaragua. Originally from the town of San Miguelito, Beatriz hopes to fulfill her dreams of returning to her home town, see the ocean, eat a hamburger and go to the movies for the first time. She says that she had a tough childhood filled with hardships while living in the countryside, in her small town and then later on in the city where she migrated in search of better opportunities. “Due to domestic violence when I was 15 years old, I moved to Managua. At age 16, I had my first son Cesar and then a year later, I had Jonatan. Their father abandoned us during my second pregnancy in 1996,” Beatriz says. When Cesar turned two, he was diagnosed with chronic renal failure, a disease that was unknown to Beatriz. “I was 18 years old and I didn’t know what do. I told myself that I would look for ways to make money and take my son far away to cure him. I didn’t understand that his disease was in his blood and that I could not extract it,” she tells us. Posing in front of “El Mercadito” left to right: Jonatán Velázquez, Cindy López Espinoza, Beatriz Espinoza y Yorlin Montalbán. Forefront: Cristofer López, Eric David López y César Velázquez. Beatriz became a Pro Mujer client in 2010. Her initial loan was US$80 which she used to start building the room for her son and to start her vegetables and fruits business. Beatriz was always positive and found the economic means to survive. “My son was slowly dying and I could not go to the streets to work. During that time, I received my second loan of US$120 from Pro Mujer. I used this loan to diversify the products for my store. Now, I sell fruits, vegetables and sodas. Pro Mujer helped me when I needed it the most, with no guarantees. So I will never disappoint them”. Meanwhile, Cesar survived connected to a machine that cleaned his blood. Only last year, the doctors mentioned the possibility of a kidney transplant. “That’s when I turned to my two year savings from Pro Mujer. I made all the arrangements and Pro Mujer helped me out. They made an exception in order to give me all my savings. Cesar and I had to go through some urgent exams abroad to assess whether we were compatible and I could donate him one of my kidneys”. Beatriz wrote a moving letter to Pro Mujer about her situation. She not only received US$500 from her savings but also additional help from employees at Pro Mujer who knew her story. Last November 7th, after 17 years of suffering, Cesar received one of her mother’s kidneys. “I am so grateful to Pro Mujer and my mother who gave me the opportunity to live”, says Cesar who is planning to go back to high school. Beatriz’s life goes on. She is the president of the communal bank “La Dalia” in Villa Reconciliacion. Her business continues to grow and with her earnings she feeds her children, buys their clothes and pays for their studies. Jonatan is attending his second year of engineering at the National University of Nicaragua. Her two girls are about to finish high school and the twin boys are in fourth grade.